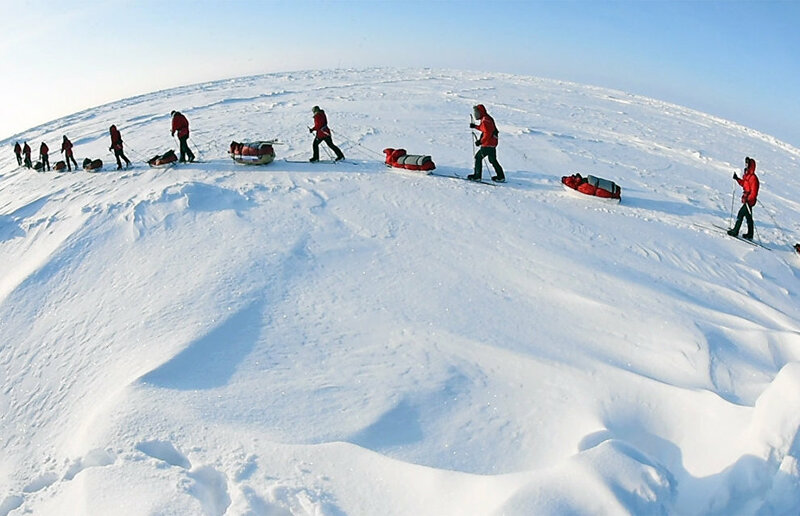 In mid-April, 14 school students from Moscow will set out for the North Pole under the Big Arctic Expedition. One of the teams headed by Matvei Shparo is to ski about 100 kilometers toward the Top of the World, with members of the second team conducting experiments at the Barneo drifting station. The other day, teenagers at School No. 329 were offered an Arctic quiz to test their knowledge of the region. Students from the school's 8th-11th grades gathered at the hall of ceremonies and formed teams with exotic-sounding names, including The Arctic Reindeer, two Blue Whale teams, the Burr Cartel and Civil Defense. It is hard to understand whether the latter's name was linked with a subject which is no longer included in the school curricula or with a famous music band that fell apart after the death of its frontman Yegor Legov. First, Maria, who hosted the event, asked the participants whether they knew people like Vladimir Rusanov, Georgy Sedov and Fritdjof Nansen, with most of the students saying no. When Maria mentioned Matvei Shparo, everyone said they knew him. She then asked tenth-grade student Nikolai, a member of the 2018 expedition, to give a pep talk. At the end of his brief speech, he said: "Dreams come true. If you want to visit the Arctic, you will get there, no matter what." Judging by the audience's mumbling, far from everyone was eager to go to that God-forsaken place, and the children obviously felt more comfortable inside the dry and heated building. The teams were issued tablet computers and asked to answer the questions in the quiz. Maria told everyone that all photos taken by these devices, not owned by the children, would be used in the interests of the event organizers. It took the young people 5 minutes to invent their teams' names, and then they started answering the questions. The four-round quiz featured five questions per round. It may be surprising, but everyone was quiet when it came to considering the answers because the students didn't want to discuss their guesses out loud, so as not to help their rivals. The teachers walked the aisles, just like during tests, and saw to it that no one used smartphones, although it looked as if they were prompting the students. Some of the fans who were allowed to attend the event started fooling around with their smartphones, and others cheered on their classmates. One boy literally shouted the answer to one of the questions "Lard, lard!" to the Burr Cartel, but everyone told him to shut up. Passions ran high at the school's hall of ceremonies; the desperate boy stood up and asked whether there was any real polar explorer here. Nikolai came up to him and answered all his questions. The list of crew members for both teams, The Pole and Barneo, for the Big Arctic Expedition, will be announced on March 24.